Heading down to the Jersey Shore this summer? Looking for a beautiful Victorian inn for your lodging accommodations? If so, you have got to check out the Cape May Alexander's Inn in beautiful Cape May, New Jersey. You can get the Inn's specific information from their web site and make sure you sign up for their email newsletter to be kept "in the know" on their specials and deals. 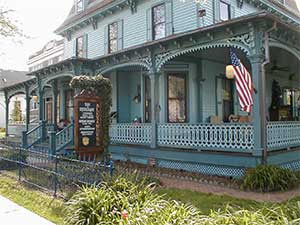 The Cape May Alexander's Inn is owned and operated by Inn Keepers Larry & Diane Muentz. I have never personally stayed at this Inn but it is on my to do list! I love Inn's like this...especially ones with Victorian charm! We love visiting Cape May New Jersey as there are a lot of free and low cost things to do down there. The beaches are large white sandy beaches that are impeccably clean. If you visit the area...make sure you stop and tour the famous Cape May Lighthouse, visit Sunset Beach for the BEST sunsets in New Jersey, visit the Cape May County Zoo and don't forget to check out the Cape May Lewes Ferry and take a ride across the bay. From bike riding, to miniature golf to dolphin & whale watching cruises...Cape May has it all! If you want to escape the hustle and bustle of Atlantic City, Ocean City and Wildwood....Cape May is definitely the place you want to be!